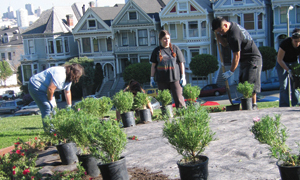 Friends of Lafayette Park (FOLP) is a non-profit volunteer organization dedicated to the enjoyment, safety, and improvement of Lafayette Park in the Pacific Heights neighborhood of San Francisco. We are fiscally sponsored by the San Francisco Parks Alliance. If you are passionate about the park, there are a number of ways in which you can get involved. Visit the Friends of Lafayette Park. Donate to Friends of Lafayette Park.